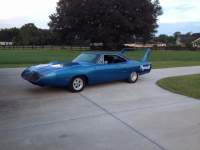 Burnt EB5 Superbird RM23UOA179753 ! 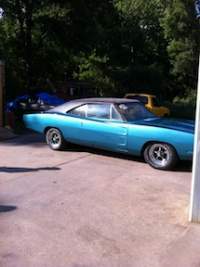 DodgeCharger.com Forum > Discussion Boards > Aero Cars (Moderators: Chryco Psycho, hemigeno, firefighter3931, Charger-Bodie) > Burnt EB5 Superbird RM23UOA179753 ! Re: Burnt EB5 Superbird RM23UOA179753 ! 4DAYS 23 hours to bid? they updated aution says it sells 1 22 19. BID AWAY if you want it. Anyone care to get into the "what-will-it-sell-for pool"? Then there will be "what-the-heck-are-they-going-to-do-with-it pool". I'm going $14,900 for the first pool. Owner can say: "yeah... I own me one of those Million Dollar Superbirds; although it's not running right now". Probably a good deal: It cost me a lot more for my 3rd key to the "Aero Car Owner's Only" bathroom! Throw your money away is more like it, that thing is junk & the VIN has very thankfully been flagged in the legal system. Bid is at $2050 with 3 days left? 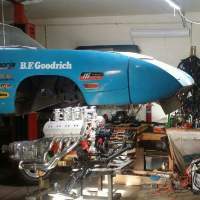 I would not be afraid to attempt to save this car, With a donor roof and the sheetmetal that is available from AMD I think it can be done. I think the metal that was heated,can be reheated and oil quenched to revise strength. How would you feel if you were the 3rd buyer after this thing is flipped a few times? Then you found out it was this Frankenstein? Even worse, say someone cobbled it together and then someone down the ownership train had their grand kids in the car and a disastrous accident happens? There is no reason this has to be saved. There are plenty of whole cars. My take is that this is just greed, plain and simple. If anyone burned up a Toyota Camary like this what would happen? I'm guessing a 1970 Satellite will be driven under the tags to be a donor. I was at the Mecum auction at Back to the 50's in 2011. It could have happened at any auction, so not to call any auction house out. This Chevelle I believe had gone over the block with a "Bid Goes On". It gets driven back to one of the barns and the suspension gives away. What would have happened if a new buyer had bought it, put it on the street, then dropped the hammer to see what it would do? That Harbor Freight JB weld just isn't the same as the real stuff!! The owner was hoping he could get by with the HF JB weld holding the suspension together, but it didn't quite work...I am kidding of course. Scary stuff right there. 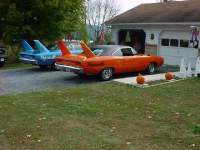 I thought the air grabber option was not available on a Superbird. Was this a mod someone did or were there some that had the air grabber? I knew the car, rode in the car, in the early 80s. Yeah , just saw it thank you. 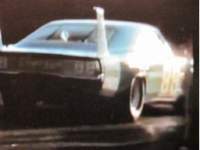 build a saltflat,road racer, nascar out of it? a striped down ,caged up race toy. if I recall past info. strip an dip burned cars to reverse fire ,heat damage to sheetmetal. But what reverses anything warped? Well damn!! Someone wanted it worse than I did. I just got outbid at $ 15,100. $ 25,500 right now. Crosses the block in about 85 minutes. Maybe the owner will put it back to the way Milt had it. It certainly is an iconic car in our hobby. He's got his work cut out, but I'd love to have been the one facing that problem. Its real sad to see a 'burnt-up' Birdie indeed! There was a time when Birdies and Tona's were laughed at and unwanted, plus hard to sell. In the early 80's they were lounging on 'dealer lots' for a measly $5000! Paid $ 4,200 for mine in 1982 !! Does the $25,500.00 include all the auction add ons? When it was at $19,000.00 there were about $1,000.00 in add ons! Now that it's sold I don't see the add ons anymore?